ANY CAMPAIGN YEAR COMES WITH ITS OWN QUOTIENT OF BAKED-IN CIRCUS FLAVOR. The way nations choose their leaders may be fair, unfair, inefficient, brilliant, or banal, but they never fail to offer up their own brand of home-grown crazy. There is no hat too undignified, no button too provocative, no face-paint too garish. Maybe camp-followers in an election are spiritual cousins of the fanboys who walk the halls of ComicCon, arrayed like Wonder Woman or Wolverine. Whatever the motivation, photographers paying any attention whatsoever in an election year can always find plenty of low-hanging fruit, anywhere voters gather. The shot at left just had to be snapped, since it speaks to the kind of stuff that passes for entertainment on a day when the outside temperature at a Democratic rally in Arizona tops a balmy 108 and a campaign office built for several dozen volunteers attempts to host a horde of nearly 800. It makes cramming twenty clowns into a Volkswagen look like a card trick. 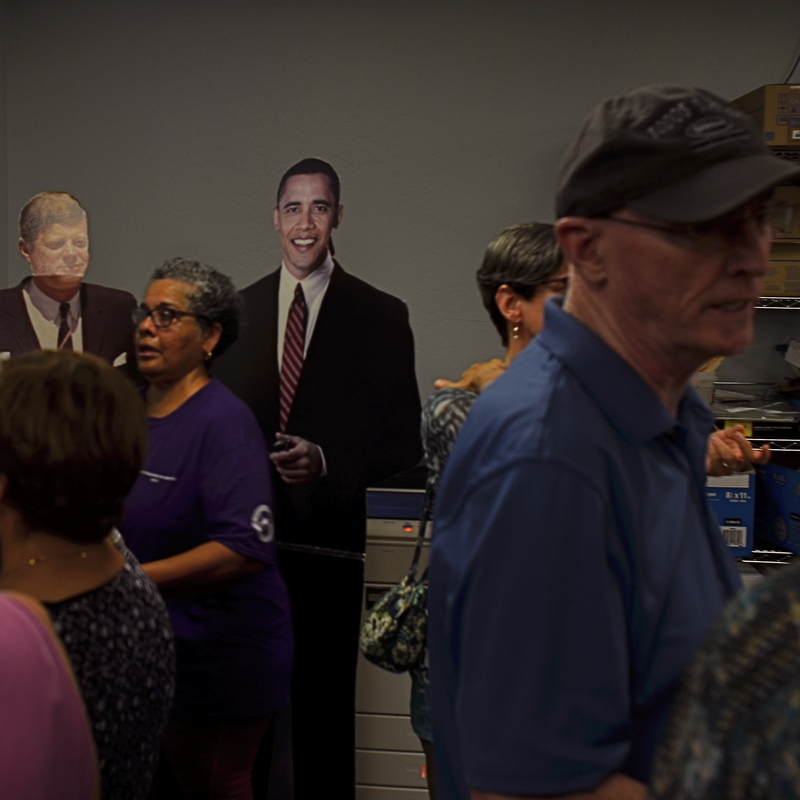 And, apparently, on this particular day, the staff thought the best thing to facilitate the flow of foot traffic was to park a pair of life-size cutouts of JFK and President Obama right at the entrance, where people could slow down even further in search of a souvenir photograph, not by their next choice for Chief Executive, but a living president on his way out and a dead president more than half the crowd only knows through newsreel footage. Not that anyone was going to get close enough to either Jack or Barry for a memorable snap, as the room was crammed tighter than the cab of the last elevator out of town, so, in the few seconds that I could stand in one place without being nudged inexorably toward the life-saving cartons of bottled water, I decided to pretend that the two prezzes were just as inconvenienced by the crush as the rest of us. Sadly, Jack’s head bent back a bit, revealing more glare than was truly presidential, but at least O seemed to be into the process. Hi, good to see ya…. Sometime politics is a proud procession, and sometimes it’s a clown parade. And yet, somehow, it’s always good for an occasional smile. This entry was posted on August 25, 2016 by Michael Perkins. It was filed under Humor, JFK, Street Photography and was tagged with crowds, Funny, strange, Street Photography.